With OroCRM you can automatically generate a list of contacts used for marketing purposes (mass call or mailing) subject to predefined conditions. 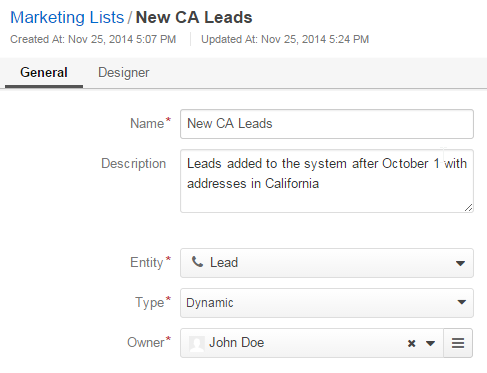 For example, you can create a list of personal and contact details of leads added to the system after October 1 with addresses in California. Such lists are called Marketing Lists. Marketing lists can be used to run Email Campaigns in OroCRM. You can also synchronize OroCRM Marketing lists with Subscribers Lists in MailChimp and/or Address Books in dotmailer. See a short demo on how to create a marketing list, or follow the step-by-step guidance below. Go to Marketing>Marketing Lists and click the Create Marketing List button in the top right corner of the grid. The Create Marketing List form will emerge. Name Name used to refer to the marketing list in the system. Entity Choose an entity from the drop-down. Virtually every entity is available as a marketing list target. For instance, marketing lists can be created based on accounts (primary email of a default contact is used), or, if you are using OroCommerce, from customer users, quotes, orders, and shopping lists. Records of the chosen entity and entities related to it will be used to create the list of contacts. Dynamic lists are updated as soon as any changes have taken place in the system. On demand lists will be updated only following the user request (refresh the grid on the view page of the marketing list record). Owner Limits the list of users that can manage the marketing list to the users, whose roles allow managing marketing lists of the owner (e.g. the owner, members of the same business unit, system administrator, etc.). Optional field Description can be filled with free text to help you and other users understand the purpose or peculiarities of the list in the future. Custom fields may be added subject to specific business needs. In the Filters section you can define the Activity and/or Data audit and/or Field Condition and/or Condition Group filters that will be used to select the records for the list. More information about the ways to define filters is provided in the Filters Management guide. In the Columns section, define the set of fields. The only goal of this set of fields is to visualise records that meet the filter requirements. Value of the chosen fields will be displayed at the View page of the Marketing List. Marketing activities require some contact information, so at least one column that contains it must be selected. A list of these fields is provided in the Designer section. (e.g. for contacts these are Primary Email and Primary Phone fields). Choose the fields from the drop-down in the Column section. Label is the way the field will be referred to in the grid. The value defined for the field will be added by default, but can be changed. Define the sorting order if you want the grid to be sorted by the field value. Save the list in the system with the button in the top right corner of the page. Action buttons. To learn more about grid actions, see Grid Page. Mapping buttons: As soon as OroCRM has been integrated with a third party system, to which a marketing list may be mapped, you will see Connect to buttons, with which you can, for example, map the list to Subscribers Lists in MailChimp or Address Books in dotmailer. See general details of the list. See the grid of all the records on the Marketing Lists. Columns defined in the Create form. “TOTAL CONTACTED” column: contains the number of times a record of this marketing list was contacted within different E-mail campaigns. “LAST CONTACTED” column: contains the date when a record of this marketing list was last contacted within different Email campaigns. Please note that if the same record is a part of different marketing lists, its data from other marketing lists will not affect the TOTAL CONTACTED and LAST CONTACTED values. “SUBSCRIBED” column: Initially all the users in the list are subscribed (the column value is “Yes”). If following one of the Email campaigns using the marketing list, a user has unsubscribed, the value is changed to “No” and the user is excluded from the next mailings. As soon as at least one item has been deleted from the marketing list, it is moved to the Removed Items section of the Marketing list view page. Now, you can go ahead and use contacts of your marketing lists to run dedicated campaigns among the customers that best suit your purposes.